Want to learn more about piezoelectric micro motors, micro stages, motion systems and applications? Here are some articles and papers that we think you’ll find useful. Have a look, and then give us a call with your questions about the technology and its applications. We love this stuff! Article published in Medical Design Technology – This article reviews several solutions in which piezo motor technology is enhancing the capabilities of medical devices. We include a discussion of micro- and nano-fluidic pumps, implantable devices and surgical robots. Technical paper presented at Actuator 2008, By David Henderson, Qin Xu and Danielle Piazza, New Scale Technologies. This paper describes the use of the SQUIGGLE motor in AFOZ modules, and presents the company’s newer UTAF motor for ultra-thin autofocus cameras. 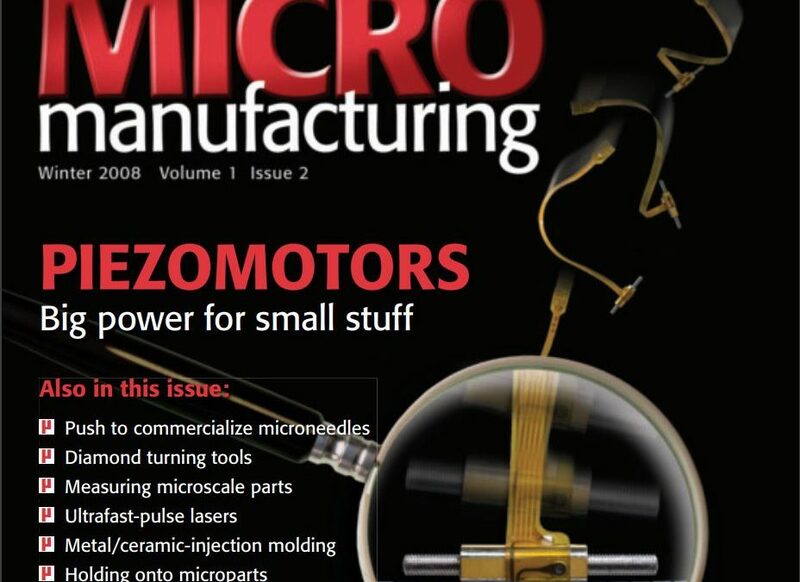 Article in MICROmanufacturing Magazine by Bill Kennedy, Contributing Editor – An excellent introduction to piezoelectric motors. This article presents a background explanation of the piezoelectric effect and its use in several different motor designs, including New Scale’s direct linear drive SQUIGGLE motor as well as MicroMo’s Piezo Wave and Piezo Legs configurations. Article in Elektronik Magazin – The combination of small size, low power use and high precision makes the SQUIGGLE motor interesting for applications including mobile phone cameras, electronic locks and latches, medical devices such as endoscope optics and drug pumps, and microfluidic devices including fuel cells and lab-on-a-chip devices. This article describes the operating principle, electrical integration, and applications of SQUIGGLE motors. Technical paper presented at NSTI Nanotech,by David Henderson. We present “the world’s smallest linear motor” and its use in tiny syringe and reciprocating piston pumps for microfluidic applications. Article in Electronic Products magazine – This article compares piezo motors to other motor technologies for micro cameras, including miniature electromagnetic motors, voice coil actuators, liquid lenses, and piezo bimorph actuators. It then compares two types of piezo motors that have been commercialized for micro camera applications. Technical paper presented at Actuator 2006 By David Henderson – introducing the SQUIGGLE motor. Article from Machine Design Magazine – by David Henderson. Motors that can precisely position loads with micrometer-scale accuracy are now inexpensive enough for consumer electronics. These books provide a detailed understanding of the operating principles behind the different types of piezoelectric motors, and an introduction to micromechatronic system design.